A sure sign that it’s spring and summer in Cleveland is Walnut Wednesday in Downtown Cleveland. 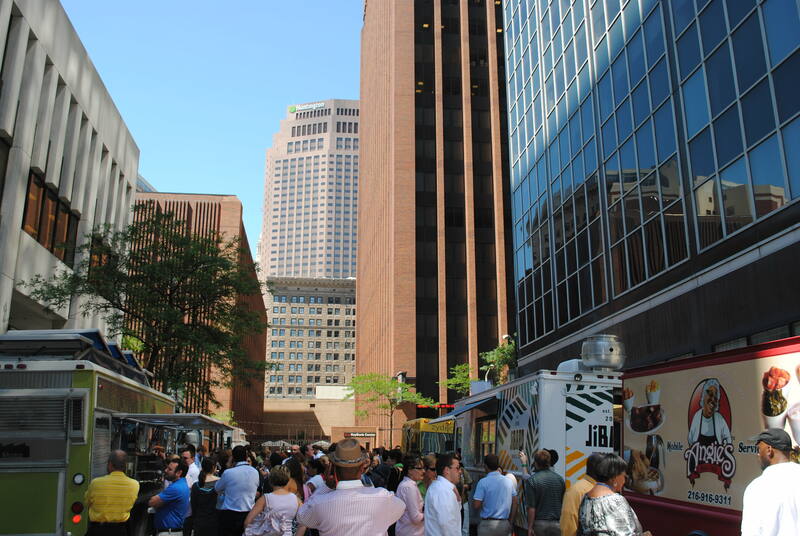 Every Wednesday from 11-1:30pm, downtown Clevelanders gather in the NineTwelve District to eat some of the best food that Cleveland food trucks have to offer. Add in sunshine, music and friends and it’s the perfect way to celebrate the middle of the work week. Check out the Downtown Cleveland Alliance Facebook page to learn more and watch for more great Downtown Cleveland events! What’s your favorite food truck? Any must-haves when you hit up the Cleveland trucks? This entry was posted in Uncategorized and tagged Downtown C-Town, Entertainment, Foodie, Overheard in the Workplace, Summatime, The CLE. Bookmark the permalink. I like StrEat and Touch, but want to try Fired Up.